Our research, teaching and outreach efforts are based out of the Department of Earth and Planetary Sciences, along with the Department of Anthropology. The laboratory is located in the Biological Sciences Building on Douglass Campus in New Brunswick. Support for our work comes from the National Science Foundation, International Continental Drilling Program, the Leakey Foundation, the Care Foundation, and the Center for Human Evolutionary Studies. EarthRates Workshop Cat Beck hosted a drilling workshop at Hamilton College, 20-22 April, 2018, to begin planning for the next coring campaign in the Turkana Basin. Twelve scientists from around the world met to consider options including a long core from a floating platform on Lake Turkana, a single deep land-based core, or a transect of overlapping shorter cores. All are intended to target the important Plio-Pleistocene stratigraphic window that has yielded the rich fossil and archaeological record of the basin. Bob Raynolds discussing deposodes at the EarthRates Workshop. West Turkana 2016 This summer, fieldwork in West Turkana tackled four localities: Kaitio, Central Island, Kabua, and Locherangan. The field team included Craig Feibel and Melissa Boyd (Rutgers), Cat Beck (Hamilton) and her undergraduate students Mary Margaret Allen and Mary Langworthy, along with post-doc Emily Beverly (Georgia State). Travelling light, we were able to cover much ground, and adapt to the rapidly changing landscape. Work at Kaitio was complicated by heavy rains, but we managed to measure new sections and collect critical samples. Sampling along the Kaitio laga after unseasonal El Nino rains. Exploration on Central Island focused on a reconnaissanse of the crater lakes. Flamingo Lake proved a fruitful coring site, while Crocodile Lake lived up to its name (and we kept our distance), and an arduous trek to Tilapia Lake found it considerably reduced in size. Kabua Gorge continued to produce interesting discoveries, with new tephra and details of Late Pleistocene - Holocene fluctuations in Lake Turkana. Exposures of the Galana Boi Formation at Kabua. The Miocene locality of Locherangan, last investigated by William Anyonge in the 1980s, proved to have a rich record of lacustrine clays with extensive paleosol overprints. The steep exposures at Locherangan made sampling a challenge. From top Emily, Mary Margaret, Cat and Mary perched on the cliff. GEO 303 The Geology Module of the Origins Field School at the Turkana Basin Institute moved to Ileret in February. The two-week field course in northern Kenya trained students in geological field methods, mapping, and the geological history of the Turkana Basin. Instructors included Craig Feibel and Linda Martin (Stony Brook), along with Bob Raynolds (Denver Museum of Natural History). At Ileret, students explored the classic exposures of the Koobi Formation, and moderm shorline process along Lake Turkana. The highlight of the session was our fly-camp near Koobi Fora spit. Linda Martin explains sedimentary strata to GEO 303 students in Area 1 at Ileret. Check out the Spring 2016 TBI Field School blog here. Students constructing a sholeline profile on the beach at Lake Turkana. Lake margin strata of the KBS Member in Area 123 at Koobi Fora. HSPDP2 The second annual meeting of the Hominin Sites and Paleolakes Drilling Project (HSPDP) was held in Atlanta, GA, in January 2016. The research teams for all five 'legs' of the project (Afar, Turkana, Baringo, Magadi and Chew Bahir) met for two days to discuss progress and planning. Again, the WTK13 coring and analysis team was well-represented. Cat Beck shows off the WTK13 core on the GSU Interact Wall. Napudet 2015 A new collaboration with the Napudet Paleontological Project, directed by Isaiah Nengo, explored a complex terrane of Miocene and Pliocene strata exposed in the northern Napudet Hills. Though largely volcaniclastic in nature, the deposits preserve some exquisite fossils. A basalt dated to 12.8 Ma by Ian McDougall and Frank Brown lies under the fossiliferous strata, suggesting a Middle Miocene age for the key localities. Prospecting for fossils on the 'Red Hill' at Napudet. KBS Cyclostratigraphy A stratigraphic analysis of the exposures around the KBS site at Koobi Fora is included in the recent paper by Carol Ward and coworkers (link), describing the associated ilium and femur, KNM-ER 5881. The geology not only constrains the age of these fossils to 1.9 Ma, but provides a detailed perspective on the cyclical nature of climate-controlled deposition at this time (read more). GSA Vancouver 2014 The annual meeting of the Geological Society of America in Vancouver, BC, was the venue for a series of updates on progress of the WTK13 core project. Cat Beck presented a synthesis of new results from our lab (pdf), while other talks and posters gave details of related investigations. Kanapoi Fieldwork 2014 Working with the West Turkana Paleontology Project (WTPP), Craig Feibel and Melissa Boyd spent a month at Kanapoi investigating the sedimentary context of the fossil assemblages including much of the hypodigm of Australopithecus anamensis. The work focused on detailing localities in riverine floodplain and delta settings, and circumstances of accumulation, burial and pereservation (read more). Drilling success! Our long-awaited drilling project in East Africa, the Hominin Sites and Paleolakes Drilling Project (HSPDP) collected over 200 m of core from West Turkana in June and July, 2013. This effort targeted Early Pleistocene lake records of environmental change in close association with important paleoanthropological sites. Our cores are archived at the National Lacustrine Core Repository (LacCore) in Minnesota. Splitting and sampling began in mid-November 2013. For updates visit the project website or join us on Facebook. I have been working in East Africa and the Levant for over thirty years. My main interest is in the reconstruction of ancient environments, and tracing their changes over time. In order to integrate the diverse array of environmental proxies, I spend a large proportion of my time worrying about stratigraphic frameworks, chronology, and sedimentary facies. My research career in East Africa began in 1981 with work at Koobi Fora, initially under the supervision of Carl Vondra, and later working closely with Frank Brown. When Harry Merrick started up the Koobi Fora Field School in 1985, I was fortunate to be able to begin to mesh my research with teaching, and that collaboration stretched to a 12-year stint. In the 1990s I worked closely with Meave Leakey, first at Lothagam and subsequently at Kanapoi. The association has continued, through a variety of localities and back to Koobi Fora. 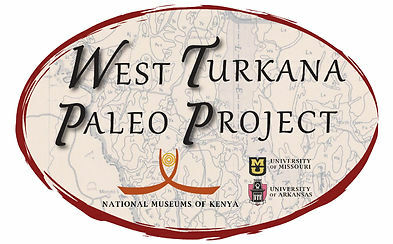 I also joined Hélène Roche's West Turkana Archaeological Project in 1994, another long-term research relationship that continues to the present. My integration of research with teaching has come full circle with the Turkana Basin Institute's establishment of a new field school, for which I was able to develop a course on the Geology of the Turkana Basin. My teaching at TBI is highlighted in a series of student blogs, which can be found in postings from 2011-18 here. Melissa completed two BS degrees at Rutgers, first in Geology and then in Evolutionary Anthropology. She joined the lab in 2013, and spent the summer of 2014 at Kanapoi. In 2015, she began her MS research in West Turkana, investigating the stratigraphy and sedimentary environments of the Lomekwi drainage in association with the West Turkana Archaeological Project. Her research will integrate tephra and facies analysis to beter understand the context of the LOM3 archaeological site, Kenyanthropus platyops, and other significant finds at Lomekwi. Cat is a sedimentologist interested in laminites, varve formation, and the climatic implications of layered sediments. Her research began with studies of classic varves in the glacial Lake Hitchcock deposits under Jack Ridge. She joined the lab in 2009, and conducted research cruises on Lake Turkana in 2011-13. Her MS thesis work focused on sedimentary patterns in small deltas in the north basin of the lake. Her PhD research integrated fine-grained sedimentation, laminites and ostracods from Ferguson's Gulf, Kabua Gorge, and WTK13 a time-series of envornmntal records and lake evolution. Anna joined the lab in 2013 to study fossil ostracods. She completed an Honors Thesis in Geology investigating taxonomy and ecology of fossil ostracods from the Turkana Basin WTK13 core. She participated in the ICD Sampling Party for the Kaitio core in November 2013, and was responsible for processing and analysis of our 550+ sediment samples for ostracods, fish and charcoal. Anna joined the Department of Geosciences at the University of Arizona in Fall 2015 as a PhD student. Robyn came to the lab to work on a lithostratigraphic synthesis of the Kaitio core data, and produced the first graphic section. She also pursued the hunt for cryptotephra in our sample splits, based on correlations with outcrop information and microscopic study of smear slides. Linda is a stratigrapher/sedimentologist working on the sedimentary sequence exposed north of the Turkwel River along the west side of Lake Turkana. Utilizing a combination of mapping, stratigraphy and facies analysis, she is focusing on the Late Pleistocene and Holocene evolution of the lake margin, including the enigmatic fossil locality of Lobolo. Linda is currently completing a PhD in the Department of Geosciences at Stony Brook University, and is the Field Director for the Turkana Basin Institute's Field School programs. the true-color Terra image at 250 m resolution is a 6.9 Mb file, but very useful. Jon Lacarrubba wrote an Automator workflow that crops this to our area of interest and is adaptable (available on request).